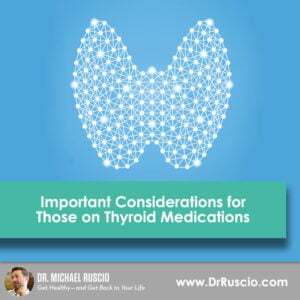 In this week’s video, I discuss three important things those on thyroid medication should consider. If you or someone you love is on any thyroid medication, be sure to be aware of these three things for an improved quality of life. Get help with thyroid medication. If you have hypothyroidism or you’re on hypothyroid medication, you know firsthand the impact your medication can have on your day-to-day well-being. Firstly, you’ve likely heard news surrounding gluten content and Synthroid. I’d like to take a moment and clear up the issue of whether or not Synthroid still contains gluten. According to recent studies, Synthroid no longer contains gluten. A recent study examined Synthroid (also known as Levothyroxine sodium tablets) for its gluten and aluminum content through sampling and testing of multiple random batches. This may be contrary to what you’ve heard regarding gluten content in Synthroid, but this is simply because Synthroid used to contain gluten. This is comforting for those with celiac or gluten sensitivity. However, if you’ve been on Synthroid for a while now and aren’t feeling better, not only is that frustrating, it can be downright worrying. Don’t give up yet, because there are a couple of things you can do right now to help yourself. Look at your lab work and make necessary dose adjustments to be sure you aren’t underdosed or overdosed. This can take some time and should always be done with doctor supervision. This occurs when your body isn’t absorbing the medication as it should. This can be confusing because your body is absorbing inconsistent levels and therefore your lab results are inconsistent. What makes matters worse is that this sometimes causes people to unnecessarily increase or decrease dosages, which can make nailing down a proper dose tricky. Malabsorption can happen in a few ways. First, you shouldn’t be eating with your thyroid medication. I hope most people know they shouldn’t be eating when they take their thyroid medication, but this is such an important point I wanted to reiterate it here. Taking thyroid medication while you eat negatively affects absorption rates. It can cause fluctuating lab results and unnecessary dose adjustments. Second, malabsorption can be caused by underlying gut issues. This is a fairly common problem so I want to take a moment to dig a bit deeper. Working with your doctor to identify and treat any of these prevalent gut conditions will not only help you absorb your thyroid medication better, it will help you absorb all nutrients better, which can significantly improve your overall quality of life. If you suffer from gut issues that interfere with absorption, including those listed above, consider taking a liquid form of your thyroid medication. Promising results have been observed in trials on patients with various gastrointestinal conditions. Those that were struggling with Synthroid or Levothyroxine absorption found that they often had better results when switching to a liquid form, such as Tyrosine and liquid Levothyroxine. In these trials, patients who switched to a liquid form of thyroid medication experienced more stable results and an improved overall condition. Whether or not you have identifiable absorption interrupting conditions like the ones listed above, if you are struggling to maintain consistent thyroid results, I’d say it’s still a good idea to consider taking a liquid form of your medication. I encourage you to find the optimum hormone combination for your best quality of life. There’s no need to settle for a mediocre existence because of your hypothyroidism or thyroid dysfunction. Comparing different dosage combinations is a relatively simple experiment you can complete with your doctor. For those without underlying gut issues, consider a trial of comparing T3 and T4 medications individually, and then T3 and T4 together. You can also compare the different brands of thyroid medications until you find exactly the right dose, brand, and combination that makes you feel best. What if the problem isn’t your thyroid? This is a very important piece of the puzzle I want to make sure we address. Too often people with thyroid conditions end up getting tunnel vision and search only for issues with their thyroid. This can cause them to miss other health conditions contributing to their issues. That being said, I want to bring you back to the gut. Often, symptoms of poor gut health can manifest into symptoms that look and feel similar to thyroid issues. These are all examples of symptoms of both thyroid dysfunction and poor gut health. So, if you’ve gone through the thyroid fundamentals in the discussion above, and you are still struggling with these frustrating issues, I encourage you to have a thorough gut evaluation. You might want to really focus on your gut health first before going too far down the thyroid rabbit hole. Remember, you don’t need to be a victim of your thyroid condition. There’s a lot you can do with the support of your doctor to tackle core issues that accompany thyroid dysfunction. I want everyone to feel their best and I truly hope these considerations help you on your path to a healthy and fulfilling life. Thanks for this valuable information. I am currently dealing with SIBO (and possibly Leaky Gut) and I have hypothyroidism/hashimoto’s – I take synthroid and have been for over 20 years.. My issues started with gut being off (I’ve had IBS for years) and then it got worse in May 2017 (I developed acne roseaca and food sensitivities), and then my thyroid and hormones went crazy. I was diagnosed with Methane SIBO in July 2017 and have had significant weight loss and malabsorption issues so concerned I am not absorbing my thyroid pill. Is it true that SIBO can make hypothyroidism worse and you aren’t actually absorbing the synthroid medicine? My lab results are now all over the place so it shows my thyroid is off. I will look into the liquid pill. Thank you! SIBO may interfere with Rx absorption, yes. So, I would do you best to improve you gut health. Tirosint may also be helpful. Hope this helps! What if you have no thyroid? I have no thyroid since 2013, but this year has been abugger of a year getting my tsh to ideal level. It keeps being undetectable with a to high T4. My levothyroxine went from 98mcg after surgery all the way up to 325mcg all the way down to137mcg with a body weight between 125 lb-140lb. My NP blames ibs and absorbtion issues, but would with diarrhea the levothyroxine eliminate faster thus causing a higher tsh not lower? I’m sick of the struggle and beyond frustrated and my endocrinologist at MD Anderson is not helpful!